Richard Malamut was raised in the Jewish tradition, worshiped with his family at the Oxford Circle Jewish Community Center in Northeast Philadelphia, attended Hebrew school and went through the Bar Mitzvah ceremony. By the age of 13, his devotion led his family and friends to believe that he was destined to be a rabbi. Neither they nor he could envision that his future lay in the diaconate of the Roman Catholic Church. The first to pick up on where Malamut’s spiritual journey was headed was Kathy, his wife, and mother of the couple’s three children. She somehow knew, never pushed it, devoting herself to her own faith and leaving the rest, she said, to God. 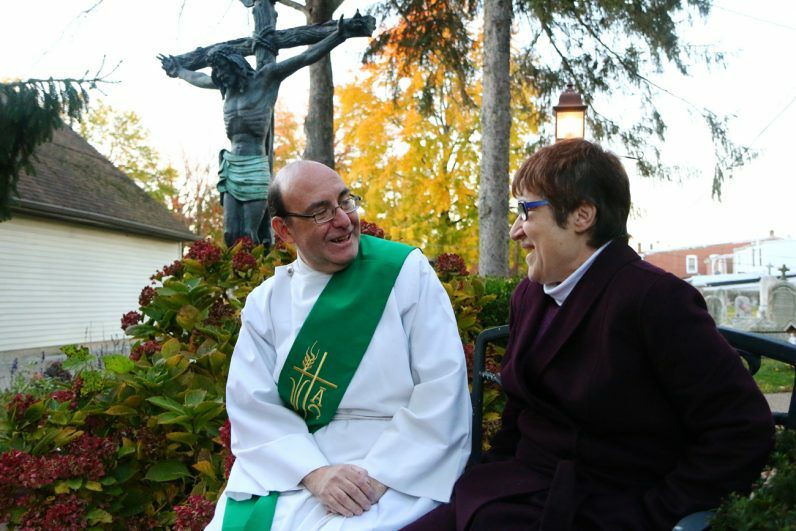 The couple married in 1981, but it would be another 15 years before her husband entered the Catholic Church, and through the prompting of the Holy Spirit, would lead him to St. Charles Seminary to begin formation as a permanent deacon. 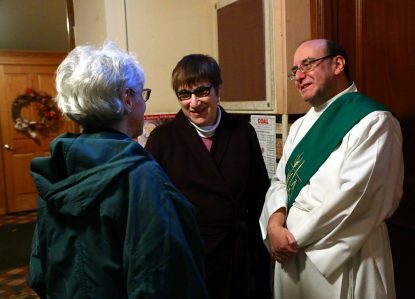 On a recent Saturday evening, following the 5 p.m. Mass at St. Mark Parish in Bristol, Deacon Rich — that’s how he refers to himself — shed light on his own stop-and-start journey that led him to his current ministry. He recalled his late teen years as the time when he began to drift, he said, taking issue with some of what he saw as man-made rules that he thought conflated the meaning of Old Testament scripture. For instance, Deacon Malamut grew up never consuming milk and meat at the same meal. That ancient prohibition is written in the Torah (Exodus 23:19 and Deuteronomy 14:21), where he said, it was considered cruel to “bathe (or feed) a kid” — or any young animal — that was about to be sacrificed in the milk that was supposed to nourish the kid. “I never in my life ate meat and drank milk” during the same meal, he said. Another practice that Deacon Malamut began to question was the one about not working on Sunday. “I could understand maybe not driving a car. But not turning on a light switch? Really? It all got to be too much. Where were they getting these things? They seemed to be just piling it on,” he said. In time, he would come to appreciate the beauty of the Jewish faith, especially as it ties into Catholicism. But during the years of spiritual confusion, including Protestantism, he remained in search mode. While he was growing up, he adhered to his family’s admonition to never mention the name of Jesus in the home. But during his later wandering, he became familiar with the concept of Jesus as Savior. At the urging of friends, he eventually became a member of the Messiah’s Lighthouse, a group of Messianic Jews, a religious movement that emerged in the late 1960s whose members cling to Jewish practices while accepting Jesus as the Messiah. By this time, Deacon Malamut was a husband and father. Kathy remained steadfast in her Catholic faith. “But I already had Jesus in my life. Why would I need the Catholic Church?” he thought at the time. The sea change came about in December 1995 because it was time, he said, for his children to start school at St. Christopher School. They’d be learning about their faith. They’d need help with homework. He didn’t want to be one of those fathers that would be asked a question, only to offer the “go ask your mother” response. So he asked the pastor if he could enroll in the parish’s Rite of Christian Initiation for Adults (RICA) classes for people preparing to convert to Catholicism. Just to understand the faith, just to be able to answer questions, he assured himself. The Holy Spirit that Deacon Malamut’s wife relied on went to work. “By December, I realized that what I was learning in those classes moved from my head to my heart. I was going to become a Catholic,” he said. The final step in his journey was not without roadblocks. One was accepting the authority of the pope and the bishops. But he came to understand that such authority made sense because it was Jesus who gave the keys to the Kingdom to the apostle Peter, along with the authority: “Whatever you bind on earth shall be bound also in heaven” (Matthew 18:18). It was no challenge to believe in transubstantiation — the transformation during the liturgy of bread and wine into the Body and Blood of Christ. Deacon Malamut said he was used to reading about miraculous events in the Old Testament. Belief in heart of the Catholic liturgy came easy to him. Kathy said she was happy but not surprised at her husband’s conversion. She had a ready answer when asked how did she “get” her husband to convert. “You don’t ‘get’ people. The Holy Spirit does his work,” she’d respond. With one exception, a cousin, Deacon Malamut’s Jewish family accepted his decision. Kathy said her husband’s family had always been respectful, attending the couple’s wedding at St. Christopher Church and officiated by both a priest and a rabbi. At the Easter Vigil Mass at St. Christopher that spring, Deacon Malamut was baptized, confirmed, and received his first holy Communion. It was one of the most joyful occasions of his life, but the Holy Spirit’s enlightenment was just revving up. An acquaintance suggested he look into becoming a deacon. Then, at a later Mass at St. Christopher, two friends made the same suggestion. “There’s a Jewish saying: ‘If three people tell you you’re drunk, go home and lie down,’” Deacon Malamut said with a chuckle. But he applied that old saying to the suggestions about the deaconate. After much prayer and evaluation, he entered the evening classes at St. Charles Borromeo Seminary in Overbrook. He was ordained a deacon in 2011 and served at St. Christopher Parish for seven years before being posted to St. Mark. The duties of a deacon include preaching, baptizing, officiating at weddings, proclaiming the Gospel during Mass, assisting bishops and priests during the Mass, presiding at wake and funeral services during the rite of burial, and presiding over devotional liturgies. The deacon’s day job is a computer programmer at the Jack and Jill Ice Cream Co. Kathy works at Giant Supermarkets. Of their three grown children, the youngest still lives in the Philadelphia area. 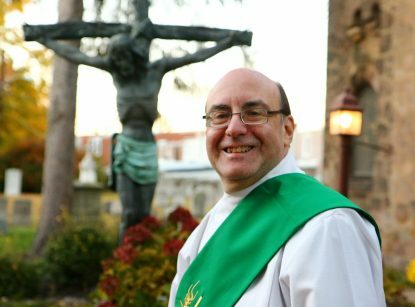 Despite his busy life and his weekend duties at St. Mark, Deacon Malamut’s ministry is a vital part of his life and faith. A deacon has one foot in two worlds, he said. One is the world of family and work, the other is the ministry duties involved. “This ministry gives me the privilege to be able to talk about the One I love to those I love. It is a privilege I will never take for granted,” Deacon Malamut said.